Miss ECO 2017 is an international beauty contest with the slogan “BEAUTY FOR ECO” The aim is to awaken the youth for saving the earth and environment, through the theme of Economic & Environment care. Miss ECO 2017 is organizing a prestigious international event, bringing together representatives of communities and cultures from all over the world; our delegates aim to share their Eco, culture and international network. 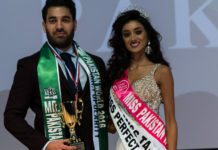 Miss Eco Pakistan 2017 is Anzhelika Tahir, who is a past winner of international pageants and has brought back 2 crowns, one gold medal and one award for Pakistan. She has been contributing to international pageants since 2016! The main objective of the contest is to choose the best Queen to be the ECO queen for the marketing of Eco-tourism all over the world and promote the principle of agreement that we will save our planet not only environmentally but culturally through the exchange of cultures between queens. This international pageant takes place in the “Land of the Pharaohs,” Egypt! The focus is on the environment and the contestants compete with their talent, their environmental friendly dress also known as “Eco Dress.” The contestants must also do a lot of earth saving activities and promote it as well! Although physical fitness is an element of competition, wellness of mind, body and spirit are the key elements of competition fitness. Harmony of these three elements perpetuates the rider’s ability to serve others. We are all excited to see Anzhelika Tahir represent Pakistan once again and hopefully bring the crown for Pakistan.